Lostpedia Blog: The Lost Rewatch: 1x01 "Pilot, Part 1"
This is my first blog post of the Lost Rewatch, and I can't say that I'm not excited. Even though this blog will only be covering the first of 103 hours, I'm ready to start watching my favorite TV show from the beginning. We're going back to where it all began -- before the Others, before the flash forwards, before the time travel, before the Jughead. We're going back to "Pilot, Part 1." As with every great series, Lost starts with an iconic shot that will come to define the series. After the episode starts off with that blurred Lost title, we get that shot: Jack's eye snapping open, dilating quickly. (Here's a fun fact: that pupil was actually the product of CGI.) This shot, in a way, remains relevant for the entire series. Not only does the eye, through its rapid dilation, convey the confusion and fear that will underline much of the mystery of the series, but it also shows that the show is more about the characters. Someone more eloquent than me once said that the "eye is the window to the soul," and surely this shot represents that we will be examining the very soul of these characters from week to week. Perhaps close-up shots of eyes have opened eighteen episodes and been seen in eighteen more. 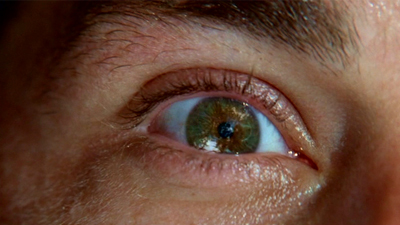 We'll see this particular shot of Jack's eye again in "316," in which Jack returns to the Island. In fact, this scene will almost be perfectly repeated, with Jack awakening in the middle of the jungle and running toward the sound of someone screaming. Does this have significance? If Jack landed in a similar place after being teleported out of Flight 316, does this mean that he was possibly teleported out of Flight 815? As Jack is still gathering his bearings, he is visited by Vincent, who walks up to him slowly before running off into the jungle. If you watched the Missing Pieces mobisodes, you'll know that Vincent was told to go wake up Jack by who appears to be Christian Shephard (but I think is Jacob's nemesis). Jack then looks at the pocket vodka that Cindy gave to him while he was on the plane, and then begins to run haphazardly through the bamboo, eventually coming out on the beach, and noticing the large amount of flaming fuselage sitting further down the beach. But before he does that, he passes a white tennis shoe hanging from a tree. The shoe seems to match the ones that Jack gave Christian to be buried in, which he talked about with Kate in "316." Does this have any significance? Probably not. It's probably just some mildly symbolic item to hint that there's been a plane crash before we actually see the fuselage seconds later. And as Jack surfaces onto the beach, we hear screaming, probably from Shannon. 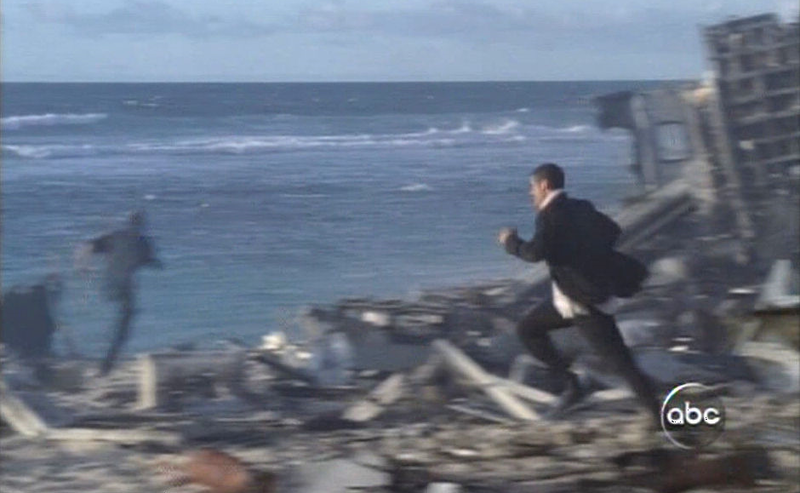 Jack dodges a turbine and runs through the wreckage of a familiar red, white, and blue plane: Oceanic Flight 815 is sitting on the beach. As Jack passes the open cabin, you can see a person hanging upside down and flailing in their seat. This person's hand will later hang into the frame as Jack looks into the cabin after the chaos subsides. Jack looks over to a turbine, and we see the second person that will become a main character: Charlie, standing next to the turbine, in shock. Jin screams for Sun, Michael screams for Walt, Shannon screams for Boone, and a man screams for someone off-screen to stay away from the gas. This wouldn't be notable, save for the fact that this actor will appear once again as the mortician in "White Rabbit," the episode that will kick off next week. A man trapped under a piece of metal screams for help (this man is played by Dale Radomski, a stuntman who appeared as an Other in season two and has conducted an interview with Lostpedia), and Jack rushes to his aid. Jack can't do it on his own, so he calls Locke and another man over to help him out. This is probably both the first and last time that Jack and Locke will work together for the same means. It was nice while it lasted. And then there's Claire, eight months pregnant with her bundle of joy Aaron, screaming for help. Jack can hardly finish tying off the wounded man's tourniquet before he's rushing to help Claire, who, even though he doesn't know it, is his long-lost half sister, and the indirect season that he was even on the plane. It's a sad irony that won't be revealed until the season three episode "Par Avion," but it only adds that much to retrospective viewing. Boone tries to perform CPR on an unconscious Rose, who, ironically, will outsurvive him for at least three years. Locke tries to warn Bad Twin author Gary Troup to get out of the turbine's way, but Troup is probably too busy worrying about his girlfriend, flight attendant Cindy Chandler (who survived with the tail section) to get out of the way, and instead stops and asks Locke to repeat himself, a mistake that costs him his life as he is sucked into the turbine, which promptly explodes. Of course, as that turbine blows, there's that flash of black swooping across the screen that many believed to be the smoke monster before it was confirmed to be just bad CGI. Jack calls to Hurley, who is standing nearby, to stay with Claire. Hurley responds less than favorably, but I think we all know that the "you gotta be kidding me" line was referencing his bad "luck," not Jack's request for help. He asks for Jack's name, to which Jack replies Jack. After pointing out Boone's incompetence as a lifeguard and sending him on a pointless mission to collect pens (which we will see another angle of in "Expose"), Jack saves Rose's life. As soon as he tells her to take deep breaths, the wing sways and threatens to crush Hurley and Claire, who are saved just in the nick of time by Jack. Sure, he's being noble, but that need to fix things is very, very evident. After that explosion, the debris of which nearly crushes Charlie, the hubbub seems to subside, and Jack wanders through the wreckage, shellshocked. He then looks into the cabin and sees the hand dangling over his head. It's a sobering moment for anyone just beginning Lost: the show is not afraid of death. Boone returns with a handful of pens, showing them to Jack. This is foreshadowing at its greatest; if Boone is dumb enough to think that the pens still matter, he obviously won't make it very long on the Island. And he won't. Jack picks out the sewing kit, and runs away into the jungle to sew himself up. Kate appears (rubbing her wrists where the handcuffs were), and he tells her to sew him up. In a later continuation of this scene, Jack will tell her the "count to five" story, which we recently experienced firsthand in "The Incident, Parts 1 & 2." As you remember, right after that story went down, Jack met Jacob for the first (and maybe only) time. Jacob, one of the biggest mysteries of seasons three through five, has been right on the edge of one of Jack's biggest memories. The sewing scene also serves as the beginning of the Jack and Kate relationship that has been so hotly debated amongst fans. It's the beginning of a complicated and often fickle relationship. But this is one of the few episodes where Sawyer is not an obstacle in the relationship between Jack and Kate. But he's introduced in the very next scene, lighting a cigarette next to the fuselage, and walking around angstily. In a deleted scene that originally took place within this one, Charlie came up and asked Sawyer for a cigarette. 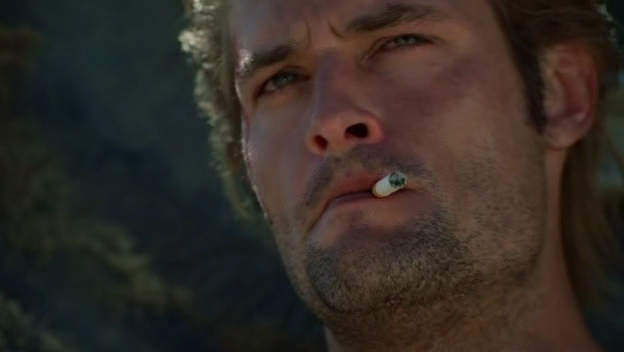 Sawyer gives Charlie the cigarette he is smoking, and lights another. Sawyer actually looks sad for a moment before continuing down the beach. Claire's standing near the surf, letting the waves lap over her feet. Kate would later call this practice "sinking," in the episode "Raised By Another," because the waves would carry the sand away. This shot of Claire would be reused in the mobisode, "Jack, Meet Ethan. Ethan? Jack." Meanwhile, Hurley sorts the food, a role he will once again have when the Swan station is discovered to have a large pantry. And there's the ever-mysterious Locke, staring out at the waves. Just this one shot let's us know that there's something...special...about him. At twelve minutes in, we meet Sayid for the first time, building a fire with Charlie's help. And meanwhile, Rose holds Bernard's wedding ring, kissing it. She knows, somehow, that Bernard is alive, even though he's on the other side of the Island. I'm not suggesting anything supernatural, but Rose's faith is very solid. I think she'd be on Eko's side in the science vs. faith debate. That night, Charlie writes "FATE" on his finger bandages, a somewhat iconinc moment for the character, and one that was immortalized with the Charlie action figure which is currently sitting next to me on my desk. 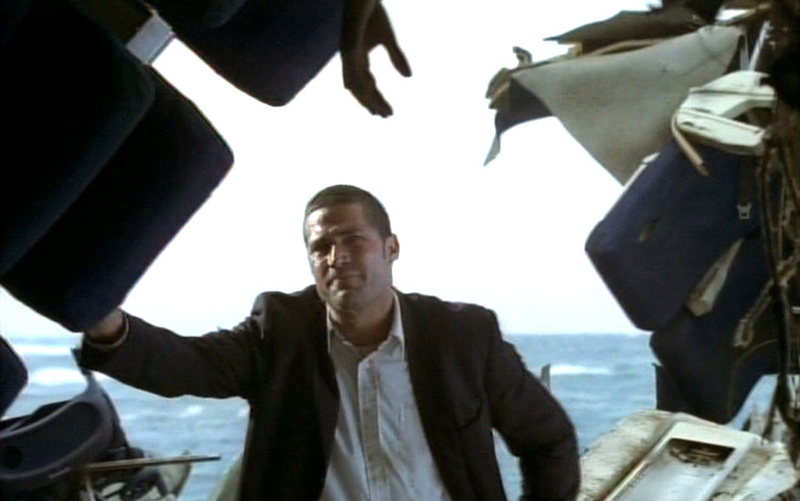 Sayid begins to express discomfort about the rescuers' lateness. Shannon and Boone bicker, setting up the light rivalry between them, which will soon end, as they will be the first two main characters to die. Shannon references the plane's black box, something that Captain Gault later claims to have with him on the Kahana, though the box in his possession was a fake created by Charles Widmore, who we unfortunately will not meet for quite a while. Walt's coldness toward Michael is shown as they lie in front of a campfire. Of course, at this point they hardly know each other. This relationship will come full circle, as Walt will eventually come to accept Michael before shunning him once again after learning of Michael's murders of Ana Lucia and Libby. It doesn't look like there will be another chance for them, because Michael was killed onboard the Kahana. Meanwhile, Jin establishes guidelines for Sun in a hard, domineering way. He's been changed by working for her father, but the relationship between Sun and Jin will drastically change over the course of the show. Sun shouldn't be pitied, she's actually more manipulative than he is. He may not be the best husband, but he never cheated on her. Jack and Kate watch over the marshal Edward Mars, who was actually transporting Kate to Los Angeles to stand trial for the murder of her father, Wayne Janssen. Kate and the marshal have quite a history together, but it'll end soon when he dies from the shrapnel (well, fromSawyer's bullet and Jack's euthanization, at least). Later, Jack and Kate discuss their experiences of the crash. Jack blacked out, but Kate remembers vividly what happened, telling Jack that the cockpit and the tail both broke off, something we'll see from a better angle when Juliet's book club is interrupted in "A Tale of Two Cities." Jack says he wants to find a cockpit for the transceiver, a mission that they will go on the next day. Jack mentions having taken flying lessons, but it "wasn't for him." Kate volunteers to tag along, something she would do regardless of whether or not they actually want her to -- a personal flaw that will get the best of her in season two's "The Hunting Party." She says that she saw smoke. While that may have been from the cockpit, we also know that the monster frequented that area for a while. And then enters the monster, the mysteriously Egyptian-related cloud of smoke that tonight terrorizes the survivors by uprooting trees in the jungle. That's not usually the monster's main objective -- usually it's more concerned with judging and killing people. It's obviously not a feral beast, but more of a calculating, judgmental beast whom I personally think is Jacob's nemesis. So is he just asserting his authority, or is Smoky doing something else entirely? Locke looks around at the jungle, hearing for the first time its mysterious qualities (aside from the healing of his paraplegia). Walt asks if the thing shaking the trees is his dog, Vincent, one of the dumbest lines of the entire series. Or is it? Vincent's always been enigmatic, but is this some hint that he's related to the monster? Walt's generally been shown to be somewhat smart and "special," and that question would be out of character for him if there's not something else behind that line. Charlie, deadpan as always, sarcastically comments "terrific." And then we get our first flashback, the very first one in a very long line. It doesn't go back very far, though; just to earlier that day. Jack's on the plane, looking out the window at the wing that would later threaten to fall on Hurley and Claire. Flight attendant Cindy Chandler asks him how is drink is, to which he replies that it's not a very strong drink. She's charismatic and sweet, and hands him two small bottles of vodka, which he will later use to disinfect the gash on his back. She walks away, and Jack will not see her again until the season three episode "Stranger in a Strange Land," because she was kidnapped by the Others during her time with the tail section. Jack dumps the first bottle of vodka into his drink and takes a rather large sip, perhaps foreshadowing to his alcoholic tendencies once rescued from the Island. He stands up to go the bathroom, but is passed by Charlie, who we find out in the next episode was running from the flight attendants in order to get a fix in the bathroom. Jack looks over, and he's sitting next to Rose, whose husband Bernard has gone to the bathroom in the tail section of the plane. Rose won't see Bernard again until the episode "Collision," when Bernard arrives back at the beach camp. The plane shakes, and for a brief moment, Locke is seen sitting behind Rose. Jack tries to reassure her, but the turbulence just gets worse. Jack promises to keep Rose company until Bernard gets back from the bathroom. Just as Jack tells her not to worry, the plane shakes, and some fool who forgot to fasten his seatbelt is flung into the ceiling. Masks drop, and the plane continues to fall until Jack presumably blacks out, ending the flashback. Back on the Island, the survivors discuss what exactly the monster was. Rose said it sounded familiar to her, even though she grew up in the Bronx. This is a reference to the fact that part of the audio used to create the monster is rendered from the reciept dispenser of a taxicab, though this subtle in-joke is often taken by fans to mean more than it actually does. Hurley also says "technically, you know, we don't even know if we're on an Island." This is also an in-joke about the fact that if Lost hadn't been picked up, the producers jokingly stated that they'd have the show end with the survivors being in Florida. Kate and Jack prepare to leave for the cockpit, but first Kate needs to get better shoes, which she morosely accomplishes by removing them from a corpse. 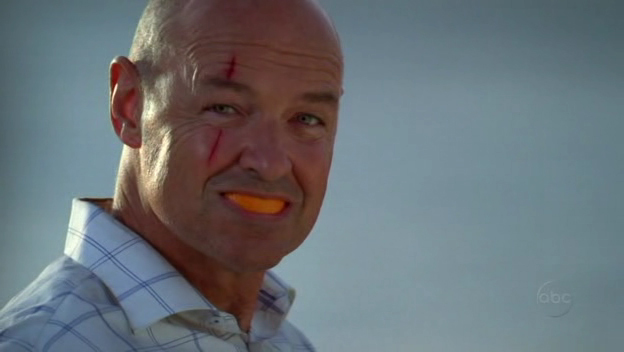 Down the beach, Locke is eating an orange, and gives her the infamous orange-peel grin, which Kate does not appreciate. However, audiences did, because it has been lauded as one of the funniest moments of the series. Another funny moment comes a few seconds later, as Hurley misspells "bodies" (b-o-d-y-s) in an attempt to protect Walt's innocence, but Walt corrects his spelling. Jack then alerts them that he's going to look for the cockpit. Charlie, remembering that he left his drugs in the cockpit bathroom, decides to tag along. On the way to the cockpit, they trek across the Mesa, a location that has been used multiple times: it was the location of the 1954 Others camp and it was where Ben killed his father during the Purge. Kate, finding Charlie familiar, discovers that he's a member of the band DriveShaft. She finds this coincidence interesting; Jack doesn't have time for such small talk. Kate says that DriveShaft was good, but Charlie insists that the band still is. He'll later accept that the band is no more in "Greatest Hits," when he says that they "had their moment in the sun." And as they walk on, Vincent watches from afar. Is he possessed by either Jacob or Jacob's enemy to look after the other survivors? After all, they both seemed pretty interested in the affairs of humans. It couldn't be hard to possess a dog, right? It starts to rain. Charlie comments that this is "day turning into night" type weather (notice the black and white similarities there). Locke sits out on the beach in the rain, enjoying himself. He's always had an affinity for the rain, as later seen in "Confirmed Dead," when he was able to predict a coming rain. And then the monster returns, knocking down the trees. Why is it doing that? But Rose knows there's trouble brewing, because Jack, Kate, and Charlie are still in the jungle. The cockpit is soon found, though, and they quickly get inside. It's on an incline, so they struggle to climb up. Jack opens the door to the cockpit, and out flies the co-pilot's body, who obviously died rather quickly. Isn't that familiar? The copilot dies first, while the pilot is left alive? Flight 316, anyone? They look around for the transciever, but instead find out that the pilot, Seth Norris, is alive. He discovers that he's been out cold for sixteen hours (the numbers were popping up back before we even knew they existed). The pilot reveals that six hours in, the radio went out. They turned back to land at Fiji, but by the time the plane crashed, they were a thousand miles off course. No one would know where they were. Which, as we would later find out, wouldn't matter anyway, because the Island moves a lot. Seth shows them where the transciever is, and then they realize that Charlie's missing. He's actually in the bathroom, getting his drugs. Kate goes out to find him as Seth realizes that the transciever's not working. Suddenly, Charlie pops out of the bathroom, dodging her question why he was in there. And then the monster lets out its signature howl. The survivors huddle in the cockpit for safety. After it looks like the monster is gone, Seth stupidly sticks his head out the window of the cockpit and is suddenly dragged out by the monster. Why did the monster do this? Did it judge Seth? 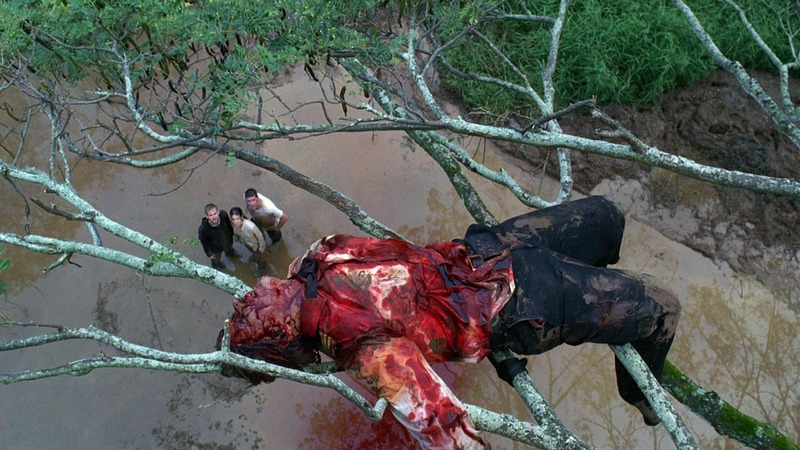 This was again, one of the strange, almost senseless actions that the monster took in the first season. All I can say was that at least Frank couldn't make it onto that flight, or he'd be gone. They flee the cockpit with the transciever after the monster knocks the cockpit down, and the monster pursues them. Charlie falls, and calls for Jack to help him. Jack, of course, having something to fix, turns around and helps. Kate flees into a bamboo patch (similar to the one Walt will hide from the polar bear in during "Special,") and screams for Jack. This moment will be immortalized in the Kate action figure. She counts to five to ease her fear, and appears to be a little calmer. Just as she seems to have gained her composure, Charlie appears, startling her. She fears for Jack's life because he hasn't showed up yet. Kate mutters that they "have to go back" for him, the first (but not the last) time this phrase is uttered on the show. Charlie argues, but she goes anyway, and he follows. While looking for him, Charlie expresses his jealousy that Kate didn't shout his name. They see Seth's pilot ensignia in the mud, and then they see the reflection of a body in a tree. Jack appears and says it's the pilot, but the pilot's mangled body leads Charlie to ask how something like that happens. The body was originally planned to be Jack's, as a ploy by the producers to shock the audience, but this was eventually abandoned so that the audience was not alienated from the pilot episode on. However, this idea of killing off the supposed leader was revisted with Flight 316, when Caesar, the supposed leader of the survivors, was gunned down by Ben in "Dead is Dead." As the pilot's mangled body is revealed, the all too familiar cut to black with the word LOST in white is shown, a formula that would continue until the season five finale, when the end title was inverted. 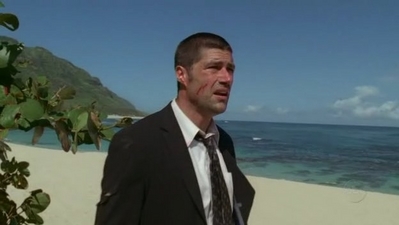 And thus ends the first episode of the Lost Rewatch. Sorry for the long post, but there was so much to cover. The next ones will be at least a little shorter, I promise. You can discuss "Pilot, Part 1" in this forum thread. You can find others' reviews of this episode at the Lostpedia hub. And also, don't forget to work on the "Pilot, Part 1" article on Lostpedia and improve it as much as possible! Look for my review of "Pilot, Part 2" on Wednesday.